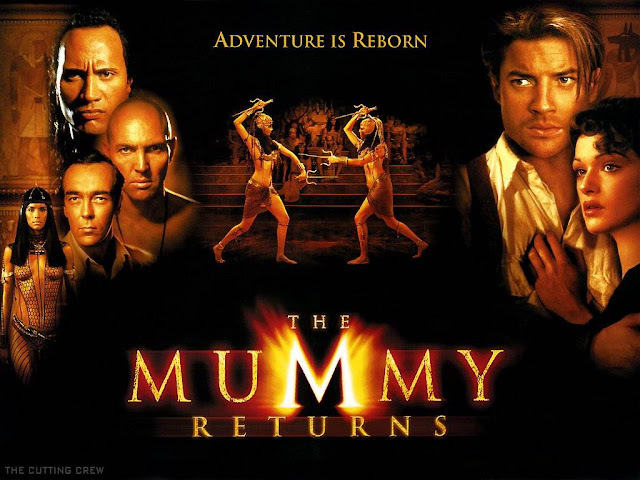 "The Mummy Returns is a 2001 American action-adventure fantasy film written and directed by Stephen Sommers, starring Brendan Fraser, Rachel Weisz, John Hannah, Arnold Vosloo, Oded Fehr, Patricia Velásquez, and Dwayne ""The Rock"" Johnson. The film is a sequel to the 1999 film The Mummy. The Mummy Returns inspired the 2002 prequel film The Scorpion King which is set 5,000 years prior and whose eponymous character, played by Dwayne Johnson (The Rock), was introduced in this film. It was followed by the 2008 sequel The Mummy: Tomb of the Dragon Emperor." "In 3067 BC, the Scorpion King leads his army on a campaign to conquer the world. After fighting for seven years, his army is defeated while attacking Thebes and exiled to the desert of Ahm Shere, where his men die of heat exhaustion. After vowing to give Anubis his soul for the power to defeat his enemies, an oasis forms to hide the Scorpion King's pyramid and he is given a legion of jackal warriors in return. The Army of Anubis sweeps across Egypt, but once their task is finished, Anubis claims the Scorpion King's soul and his army. In 1933, Rick and Evelyn O'Connell explore a ruined mortuary temple in ancient Thebes with their son, Alex, where they find the Bracelet of Anubis. In London, the bracelet locks onto Alex, showing him a vision directing him to Ahm Shere. Alex has seven days to reach the oasis, or the bracelet will kill him when the sun's rays shine on the Scorpion King's pyramid. Evelyn is captured by an Egyptian cult who resurrect Imhotep; they wish to use his power to defeat the Scorpion King, giving him command of Anubis' army to take over the world. The cult, led by Baltus Hafez, the British Museum's curator, includes a warrior named Lock-Nah and Meela Nais, the reincarnation of Imhotep's love interest Anck-su-namun. Rick sets out to rescue Evelyn, accompanied by her brother Jonathan and the Medjai Ardeth Bay. Hafez attempts to sacrifice Evelyn; a fight ensues between Rick and Imhotep. Imhotep calls on the help of mummified soldiers to kill Rick and the others. After freeing Evelyn, they flee on a double-decker bus with the soldiers in pursuit. After defeating them, Alex is kidnapped by Lock-Nah, and along with the cult travels to Egypt. The O'Connells pursue them to rescue Alex, along with Rick's associate from his past adventures, Izzy, a pilot, who provides the group with transportation. The bracelet gives Alex directions to Ahm Shere that Imhotep follows and they travel there by train. At each location, Alex leaves clues for his parents, who follow in Izzy's dirigible. Imhotep uses the Book of the Dead to give Meela Nais the soul of Anck-su-namun, but by doing so he allows Evelyn to unlock the memories of her previous life as Princess Nefertiri, the bracelet's keeper and Pharaoh Seti I's daughter. Lock-Nah finds Alex leaving clues, so Imhotep makes a wall of water that attacks the dirigible, causing the O'Connells to crash into the jungle of Ahm Shere. Izzy stays with the dirigible in hopes to repair it. By nightfall, the O'Connells attack the cult, and both groups are attacked by pygmy mummies. Rick retrieves Alex while Ardeth Bay kills Lock-Nah. They escape the pygmies, who kill the cult except for Baltus. Imhotep and Anck-su-namun escape unharmed. Rick and Alex eventually make it to the pyramid before sunrise, where the bracelet detaches from Alex's arm. Ardeth regroups with the Medjai in case Anubis's army rises. Anck-su-namun soon stabs Evelyn, killing her, and escapes with Imhotep. Rick, determined to avenge the death of Evelyn, pursues Imhotep. Baltus accidentally puts on the bracelet and revives the army. Anubis takes Imhotep's powers, wanting Imhotep to fight as a mortal. Rick finds Imhotep summoning the Scorpion King and fights him. The Scorpion King interrupts them, where Imhotep tells him that Rick was sent to kill him. At the same time, the Medjai battle Anubis's army of jackal warriors. While Rick and the Scorpion King fight, Baltus is killed. Jonathan and Alex steal the Book of the Dead from Anck-su-namun and use it to resurrect Evelyn, who confronts Anck-su-namun while Alex and Jonathan go to help Rick. The scepter Jonathan has been carrying extends into a spear that can kill the Scorpion King. The Medjai defeats Anubis' army, but have only defeated the vanguard; the full army charges toward them. Rick kills the Scorpion King, using the scepter, sending him and his army back into the Underworld, which causes the oasis to be sucked back into the pyramid. Rick and Imhotep hang above a pit that leads to the underworld. Evelyn risks her life to save Rick, but Anck-su-namun abandons Imhotep, who heartbroken chooses to fall to his death. Anck-su-namun, while escaping, falls into a pit of scorpions and dies. The O'Connells reach the top of the pyramid, which is sinking into the desert. Izzy arrives with a modified dirigible and rescues the O'Connells just as the oasis and the pyramid disappears completely. They depart into the sunset, with Ardeth Bay saluting them, before riding off."